Back in the USSR, markets offered a variety of fresh produce, meat, cured fish, and other foods, whether from the nearby countryside or the other end of the country, that you’d have been hard-pressed to find in shortage-plagued stores. Just imagine: in the 1980s, in the dead of Moscow’s winter, you could buy a duck, a pineapple, and a tin of caviar, all under one roof, without standing on line for hours (all for a mere month’s worth of your salary). Today, things have changed. Moscow’s supermarkets carry pretty much any product you fancy, probably at a more affordable price. They remain open until late, when they don’t operate 24/7. Chances are there’s one a few minutes from where you live, whether that’s the city center or a remote suburb, whereas you’d have to take a subway and / or a bus to get to the closest market. The situation is of course not unique to Russia. In Western Europe, markets have been challenged by the rise of the supermarket for decades. Yet they survive. They’re held only on certain days of the week (whereas the typical Russian market is open every day), and they gather a large number of sellers who offer a variety of products, raw or prepared, with an emphasis on freshness and quality, that a single grocery store would struggle to match. 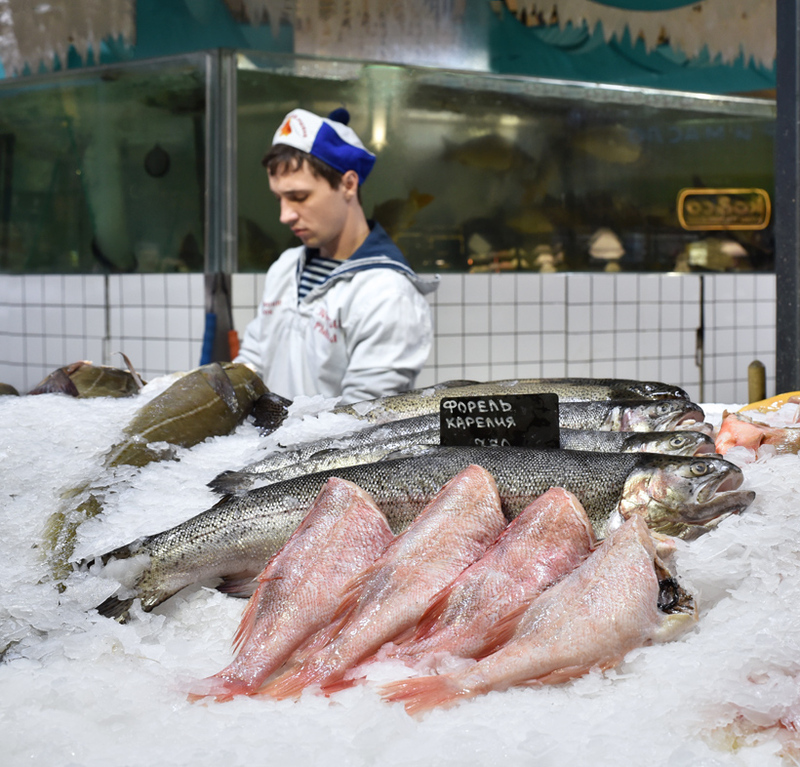 Particularly at a time when dedicated butchers, fishmongers, and produce stores have lost so much ground to the benefit of large grocery chains, markets are one of the bastions of quality food for those willing to pay the price. Some of the products sold at these markets aren’t local at all, and these aren’t farmers’ markets. These are sellers touring the various markets of a given area to hawk their products, the displaced artisans and shopkeepers of towns that have switched their high street preference from bakeries to banks, and from confectioners to cell phone stores. Markets in the USA share some of the same characteristics, with some differences too. They also satisfy a desire for better quality and freshness, and increased food variety. They are, however, farmers’ markets. In large part, the vendors are farmers or farm workers who drive to various markets to offer their own products directly (although there are some artisans in the mix as well, selling prepared goods such as bread or pasta). Farmers’ markets neatly occupied the gastronomical vacuum left by the rise of the American supermarket in the 1970s and ’80s, their number growing from about 1,750 in 1994 to almost 4,400 in 2006, and up to more than 8,100 in 2013. While many people are happy to bring home fresh ingredients, some have grown so disconnected from cooking and from the concept of a market that they treat the places like museums where they take pictures, look at the food in polite amazement (“is a pastured egg the same as pasteurized?”), sometimes try a little sample of chutney-this or Brooklyn-that, but would never consider buying anything to eat at home – unless there’s a cupcake vendor, that is. The absurd and now closed New Amsterdam Market in NYC, a so-called “purveyors market” rather than a farmers’ market, seemed to cater precisely to that crowd. The Danilovsky market is the oldest trading place in Moscow. It takes its name from the nearby Danilov Monastery, founded in 1282 by Alexander Nevsky‘s son, Daniel. Trade naturally flourished near the busy monastery, and it is assumed that the market has existed since the 13th or 14th century. 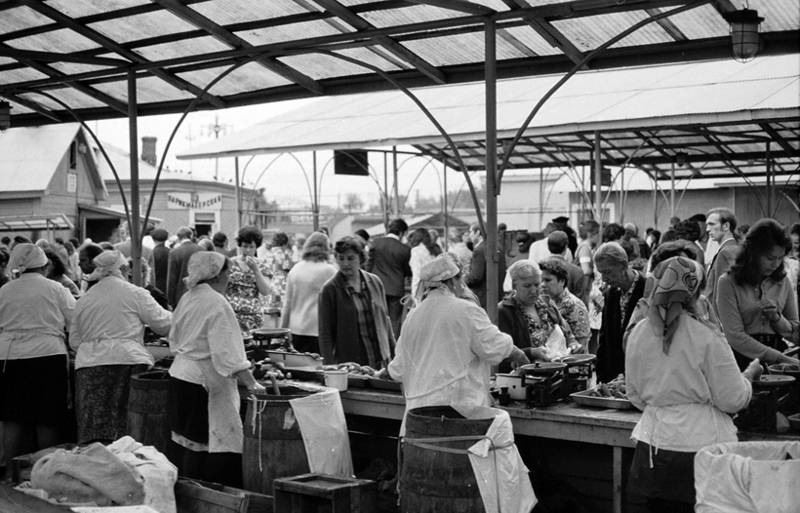 In the late 1970s, it was decided to give Moscow’s historical markets a new, modern look. Thus began the design of new buildings for the Baumansky, Cheremushkinsky, Dorogomilovsky, Usachevsky, and other well-known markets, including Danilovsky. Most of them were to be covered, making unparsimonious use of the material of choice in the Land of the Workers: reinforced concrete. This excellent article (in Russian) describes the architecture of the Danilovsky Market in great detail, and I’m providing a summary translation below. The current structure was built in 1986, and the leading inspiration for its design was the dome of the Druzhba Multipurpose Arena, built for the 1980 Summer Olympics and nicknamed “turtle” by Muscovites. With its elegant dome, the Danilovsky Market became a real embodiment of modernist ideas. Danilovskaya Square, where it’s located, concentrates in a short radius some of the most important examples of all the architectural styles that existed in the USSR. Down Serpukhov Boulevard, the Khavsko-Shabolovsky residential block is an outstanding embodiment of Soviet avant-garde from the late 1920s. Next to it, the Shabolovka radio tower symbolizes hopes for a better life. A bit north of the market, the Danilovsky department store illustrates Soviet “commercial” architecture. The mid-1950s brought modernism, which shaped the image of Danilovskaya Square itself, as it was surrounded by the Moscow Mint (behind the crane on the left, in the picture below) and the 400 meter long “ship-building” (seen on the right, with a propaganda billboard on its side). The square is also a starting point for the Warsaw Highway, along which numerous research institutes are located. But let’s get back to the market itself. From an engineering point of view, the dome has a diameter of 72 meters, and resembles a flower with 14 petals of reinforced concrete, their tips resting on the ground, and its central disc, 16 meters from the ground, a glass geodesic dome about 15 meters in diameter, necessary for lighting and ventilation. The interior of the market is one bright, large space, with visible concrete in the best tradition of modernism. Complex shaped roofs – with folded, angular, or curvilinear patterns – became one of the main themes of Soviet modernist architecture, as opposed to the Stalinist Empire style, wherein the “fifth” or “upper” facade played no role. Today, fresh produce, meat, and fish still fill the stalls, albeit in a different setting, and that’s what we’re gonna look at now. (The market also hosts about 30 fast casual eateries, which I’ll keep for my next post.) You can even order food – raw ingredients or cooked meals – online and get it delivered! “Hipster magnet,” says The Moscow Times in a complimentary fashion, praising its impressive renovation and new coolness. “A foodie paradise reminiscent of London’s infamous Spitalfields Market,” marvels Russia Beyond. 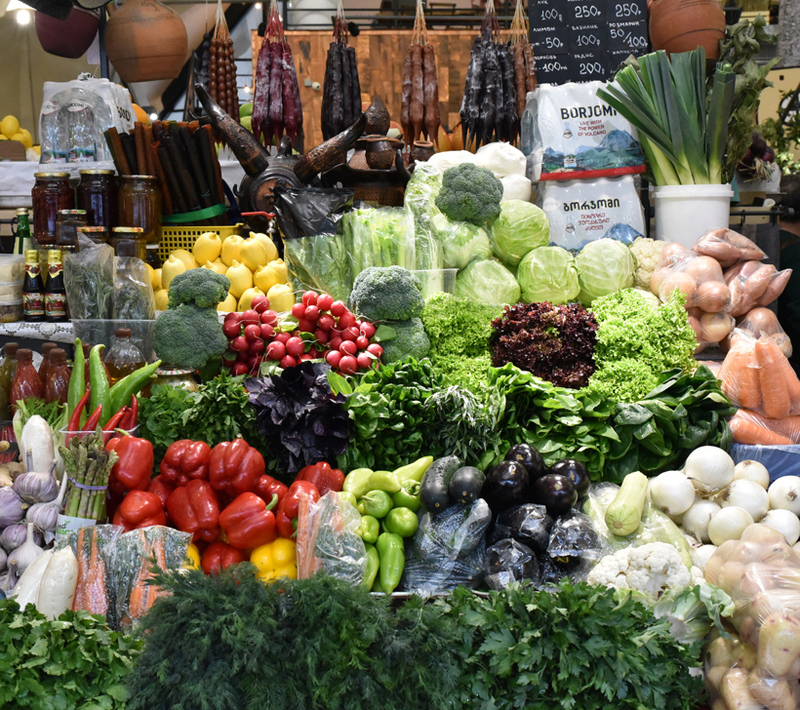 “Vendors selling the best of Russia and Central Asia’s farm-to-table produce,” comments The Calvert Journal. Let’s get in. According to Lonely Planet, “The market itself looks very orderly, if a tiny bit artificial, with uniformed vendors and thoughtfully designed premises.” And that’s probably the first impression you’ll get too. 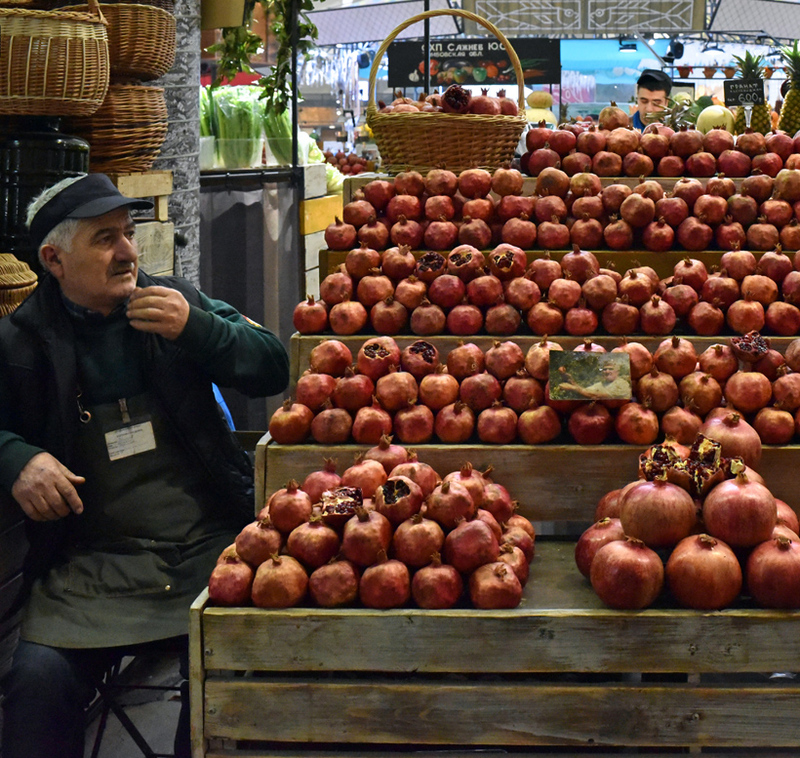 Just look at the old Caucasian man with his stall stacked exclusively with pomegranates. So far, why not? (Never mind how you pay the rent in Moscow by selling only pomegranates.) But to beef up his field cred and prove he’s not a fraud selling somebody else’s fruit imported from India, he has speckled the shelves with a few faded pictures of himself on his lands. Or see the produce vendor, who doubles up as Caucasian grocer. Want some Borjomi water with your vegetables? No problem! Georgian churchkhela? Sure! Armenian lavash? You got it! Azerbaijani narsharab? Check! I’d be only half surprised if this guy hides plov rice and beshbarmak noodles under the counter, just in case. These examples also show that seasonal, local produce isn’t necessarily the focus either. My pictures in this post were taken in November 2017, when outside temperatures flirted with the freezing point. Try growing red peppers in a climate like that. And do you remember passing by any orange or mango groves while driving in the Moscow suburbs? If yes, I think you were drunk, my friend. Neither Russia nor any of the former Soviet states produce mangoes in any substantial amount, and Russia’s not too popular for its oranges, either. And asparagus! Asparagus season in Europe: April to June. Russia’s asparagus production is so small, it can safely be rounded down to zero (see my post on LavkaLavka). It’s not necessarily a bad thing. I love variety, and nobody actually claims that the produce is local, organic, grown in house, or anything else – conveniently, there’s no labeling or other indication of provenance. But I do think that there’s no good reason to go to the Danilovsky Market just to buy any of that stuff (except maybe the pomegranates). As a matter of fact, the number of produce stalls is only a fraction of what it used to be, and usually still is in many other markets. Then come the pickles: the classic gherkins of various sizes, tomatoes of various colors, cabbage, and carrot. Do I see hearts of palm in the center and kimchi in the back? There’s a watermelon, too! I can’t say I’ve ever tried one, but supposedly, whole watermelons are pickled with salt and water in barrels, and their flesh becomes a bit similar to tomato. At least I’ve discovered something new. The dried fruits and nuts, as well as the herbs and spices, bring us back to more contrived territory. The displays are pretty and the selection is fine, though again this is a domain where modern supermarkets can compete quite well, apart from their not doubling up as Uzbek souvenir shops selling colorful plates and bowls. Anyway, let me point out a few things that are particular to Russia and its neighbors (especially its neighbors, since Russia isn’t known for its spices): khmeli-suneli (a traditional Georgian blend), a yellow powder labeled saffron (probably as in Imeretian saffron, aka marigold, used in khmeli-suneli), utskho-suneli (blue fenugreek, also used in khmeli-suneli), fenugreek (for basturma and morkovka), wild cumin and barberries (for plov), sumac (for lyulya-kebabs), adjika powder, and dried tomatoes (chopped, to be used more like a condiment; as opposed to sun-dried tomatoes). Meanwhile, the Mamdeev family offers their organic honey from Bashkiria, and that’s quite an assortment. You can buy meadow or forest honey; honey collected in May (the first of the year) or in the summer; honey from clover, acacia, cinquefoil, fireweed, angelica, 40 plants, linden, chestnut, pecan, or wild flowers. Honey with cedar sap, propolis, or chaga mushroom. And all this without a Bashkir in traditional costume gesticulating with a sword, phew! The Mamdeevs do have a website with an online store, which is a lot more useful. And now for the departments that went through a real metamorphosis… Starting with the dairy stalls. Yes, you can still buy delicious fresh milk, tvorog, sour cream, or butter. 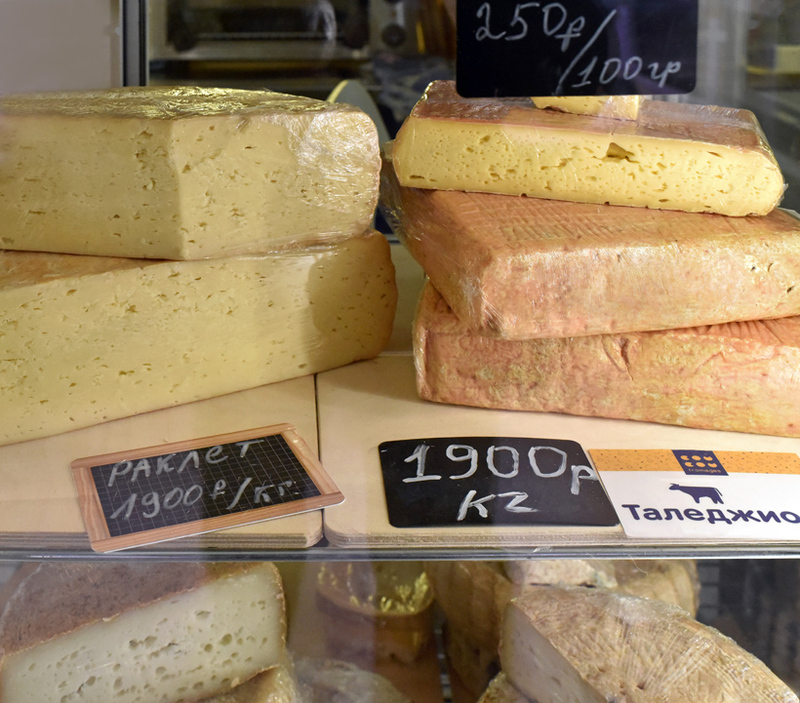 But instead of the usual handful of pedestrian cheeses, there’s a whole selection of imitation Italian (Montasio, Taleggio), and French (Camembert, Raclette, Valençay, coeur de chèvre) cheeses from the four (milk-producing) corners of Russia. 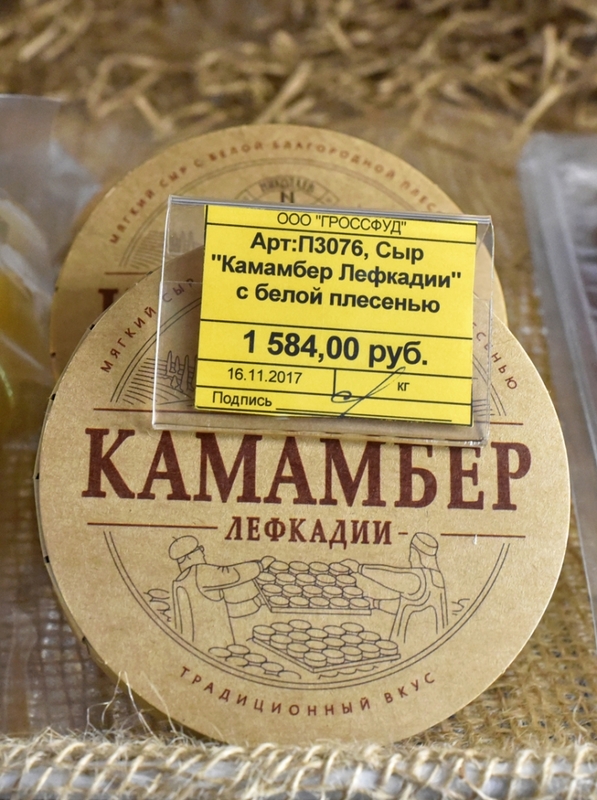 I recall that the Raclette was made in Kaliningrad, and I see Camemberts from Lefkadia and Kostroma. For the most part, these newcomers have The Sanctions to thank. Except for the Camembert, perhaps, as Lactalis has been producing similar soft, surface-ripened cow’s milk cheeses for the local market in Russia under the Président brand for many years. 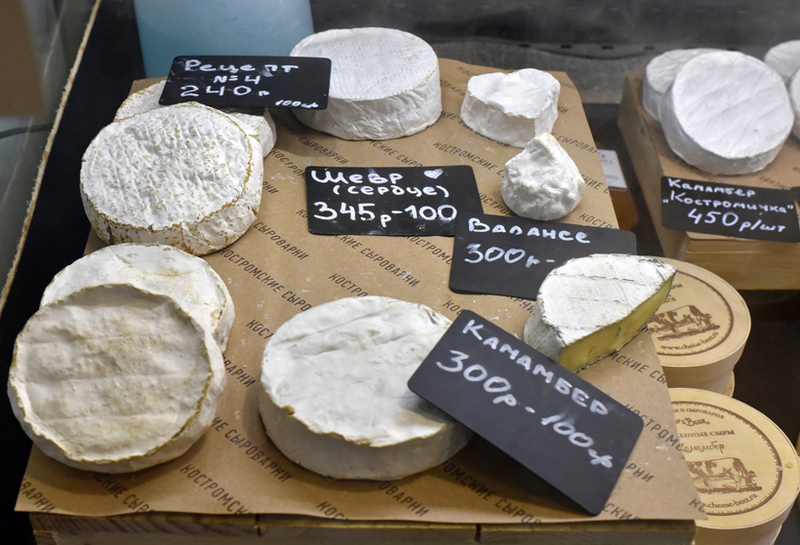 It’s no surprise, then, that Camembert has acquired a certain polarity, and is imitated by many producers, some of whom seem also to experiment with their own, potentially more interesting recipes. The meat section is also unrecognizable, due largely to the fact that following similar butchering charts as the rest of the world (you know, factoring in animals’ muscle placement rather than just chopping your way through the carcass with an ax) has made the meat… recognizable. I’m pretty sure the beef comes from PrimeBeef, the producers of the meat served at the restaurant Voronezh; there’s also a PrimeBeef Bar on the second floor of the market. Even if there’s nothing particularly exciting to the American eye, it’s a brave new world for the Russian clientèle: dry-aged ribeye, tri-tip, chuck roast, picanha (aka culotte)… all in refrigerators, no less. 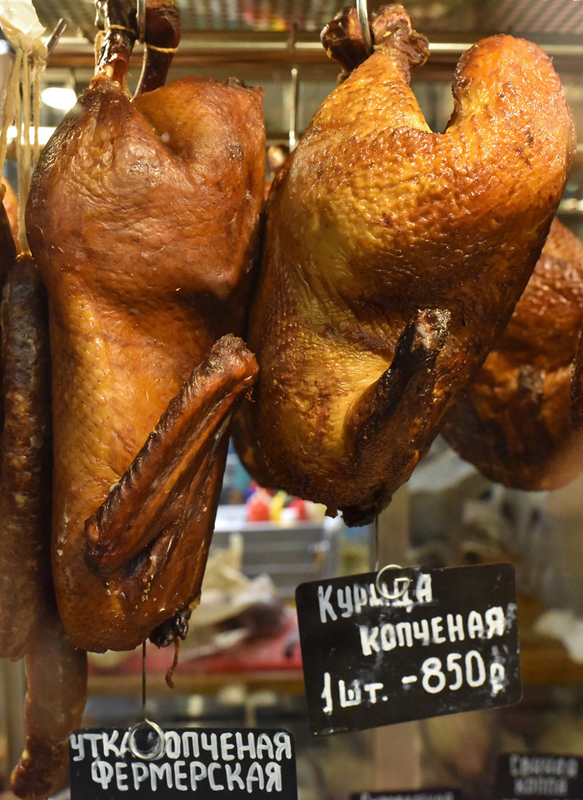 For a more traditional treat, check out those smoked ducks and chickens! Moving on to the fish department. 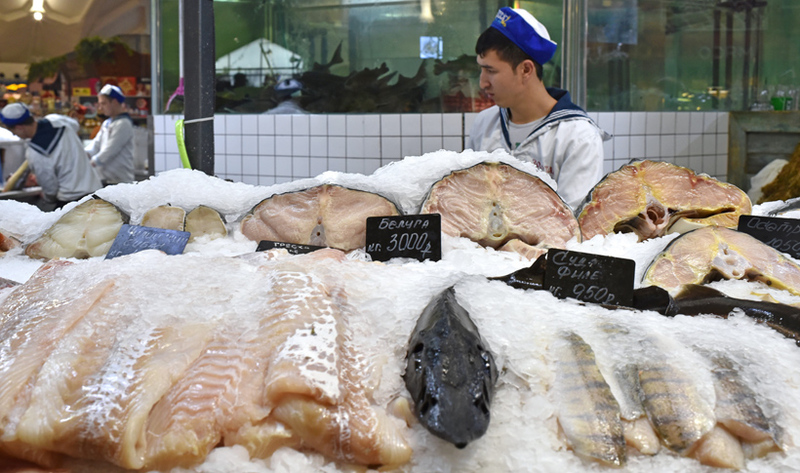 Judging by the vendors’ costumes, Russian seafood is fished by sailors, not fishermen. Granted, working in a fisherman jacket indoors all day wouldn’t very comfortable. And anyway, Russia loves its sailors. Russia invaded a country to protect its sailors! 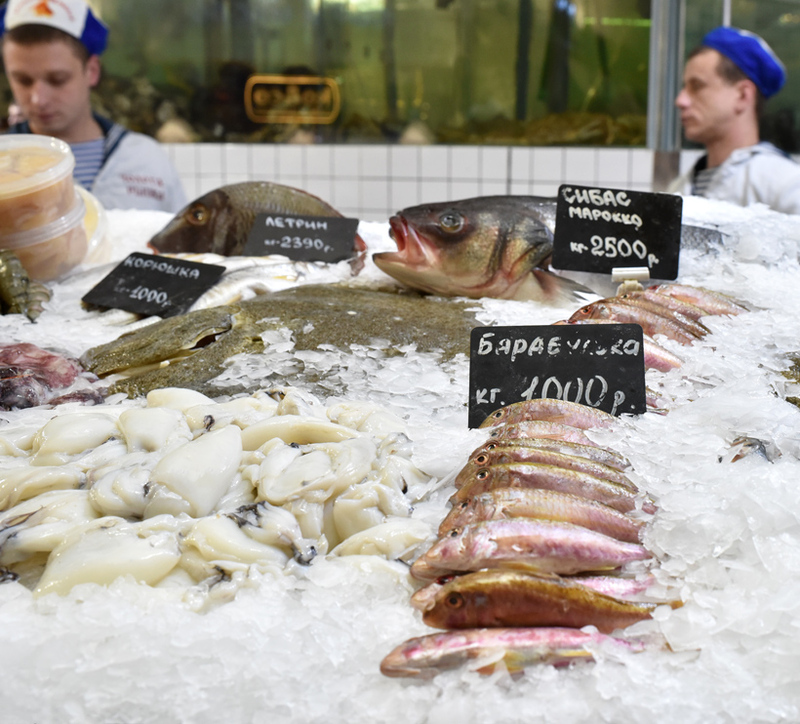 Jokes aside, while fresh fish used to be a kind of poor relation in Moscow markets (the closest sea is over 700 km away), there’s now a pretty solid selection. From the Russian lakes and rivers: trout from Karelia, pikeperch, grass carp, freshwater bream, ossetra sturgeon, beluga sturgeon (even in Moscow, this one can’t be that common). From the sea: red mullet, turbot, horse mackerel from the Black Sea, smelt, emperor bream, tuna, cod, seabass from Morocco, seabass from Chile, seabass on sale, and probably more that don’t appear in my pictures. Also squid, shrimp, and rapana. Of all the fish, turbot and Beluga win the palm d’or for most expensive, at $50 per kilo, which is quite a sum in Russia. The cured fish counter, on the other hand, hasn’t changed much – except for the price of caviar. All the classics are here: salt-cured, hot-smoked, or cold-smoked salmon and sturgeon; pike, salmon, and sturgeon roe; king crab legs; jarred fish such as catfish, pikeperch or crucian carp; marinated herring. And the usual beer snacks: salted and air-dried smelt, freshwater bream, or vobla. There’s also cod liver and sturgeon milt – I gotta remember to try that next time! The new Danilovsky market is an appealing and quite unique mix. Yes, it sometimes looks artificial, and it would help to tone this down. Maybe create a separate section, where tourists from afar or just around the corner could buy Uzbek plates, take a selfie with a sailor and a babushka, or meet a man who owns real pomegranate trees. Although the fruits and vegetables are of only marginal interest, many other departments still offer a selection with which only a handful of the capital’s top gourmet stores can compete. Where else can one find pickled whole watermelons, fireweed honey, artisanal Russian cheeses, dry-aged ribeye, smoked ducks, fresh beluga sturgeon, and sturgeon milt? Add to this over two dozen restaurants that manage to avoid turning the market into a museum and help you kill two birds with one stone, allowing you to grab lunch and do your gourmet grocery shopping under one roof. And don’t forget the online delivery service! Jeez, I live in the world capital of everything-delivered-in-less than-two-hours-comma-24/7, so why can’t the Union Square Greenmarket do that? There are many dishes on the menus of the two restaurants I just reviewed – Omulyovaya Bochka and Chemodan – that most diners will have never encountered before, often prepared with Siberian fish, game meat, or berries. One of the most intriguing, in my opinion, is the bird cherry cake. If unfamiliar with bird cherry (cheryomukha in Russia) it would be easy to discard as just another wild fruit with little gustatory interest, only good enough to use in a sauce or the occasional mors. But that would be quite wrong. First, bird cherries are rarely consumed as a fruit or a beverage, instead they’re turned into a flour. Because the pit is large, there’s very little flesh on the fruit, so the bird cherries are dried and then ground whole. The resulting “flour” is dark brown with a slight red hue, and its texture is usually coarse (as shown in my photos below). Then, the taste is anything but boring: it’s rich and complex, kind of nutty (a bit like apricot kernels), a bit fruity, almost chocolaty, and surprisingly addictive. You can buy bird cherry flour in stores in Siberia or large Russian cities elsewhere, but it’s still a marginal ingredient even in Russia, and it’s pretty much unheard of anywhere else. Good luck finding a Russian online store that will ship it to the US. Fortunately, there’s eBay – I got my flour from SiberianFriend, and he even threw in a pair of woolen socks for added local color! So what do you do with bird cherry flour? 99.99% of the time, you make bird cherry cake (White Rabbit makes a veal tongue in bird cherry dough, served with potato purée and morel sauce; I guess they’re the remaining 0.01%). Few cookbooks include a recipe for this cake, especially in English, since the main ingredient is so hard to find. The internet, however, offers some good recipes in Russian here and here (the first is more traditional, the second more elaborate). The idea is always the same: bake a simple cake with bird cherry flour, cut lengthwise into layers (often just two), spread with sour cream mixed with sugar, decorate to the best of your ability. In fact, if you really want to stick close to the original, you could make my recipe below, cut the cake into two layers, and spread the layers with a mixture of 240 g sour cream and 60 g sugar. Or double all the proportions and make a four-layer beast that you’ll decorate to the best of your ability. Or, just serve a slice with whipped cream. But my bird cherry cake really departs from the traditional recipe in a number of ways. This is on purpose; there’s no need to post comments saying “I’m from Siberia and this isn’t how you make bird cherry cake.” My version is a lot moister and softer, almost like a brownie, courtesy of a large proportion of butter. Eat it at room temperature or warm (or else the cake will feel denser). As a result, there’s no need to slather it with sweetened sour cream. This cake is also a great candidate for use in a sundae, and I’ve got a fabulous recipe for you. “Call it the Pretentious Overkill Siberian Sundae,” suggested my partner upon hearing the ingredients (which did not stop her from eating serving after serving until all the cake was gone). “It looks disgusting,” declared our daughter upon seeing the greenish mousse (perhaps because it conjured the specter of vegetables, and she rarely agrees to eat anything that’s not plain pizza or pasta). Bird cherry, of course. Not only do I use cake chunks, I also make bird cherry crumbs by drying thin cake slices in the oven. Lingonberry. Similar to cranberries but smaller, lingonberries appear frequently in Siberian recipes. This sorbet is adapted from the cranberry sorbet recipe in Caroline and Robin Weir’s Ice Creams, Sorbets and Gelati: The Definitive Guide. You can buy frozen wild lingonberries here. Dill. With its anise-like, herbal flavor, dill is an unexpected but effective complement to the bird cherry and lingonberry. What’s a sundae without whipped cream? Here, you get dill mousse instead! The mousse contains a bit of white chocolate, too (an idea I borrowed from Serious Eats). You wouldn’t necessarily notice it, but it adds some richness and mellows the dill. One day, oligarchs will eat this dessert in Moscow restaurants and wish I was their Siberian grandmother. Or their Siberian friend. Or their Siberian barber. Mark my words. Bring the milk to a simmer in a small saucepan over medium heat (or in the microwave), then pour over the bird cherry flour in a bowl. Stir, and let rest for 30 minutes. In the bowl of an electric mixer fitted with the paddle attachment, beat the eggs and egg yolks on medium speed, until homogeneous. Add the sugar and dark brown sugar, and mix just enough to combine, scraping the bowl with a spatula. Combine the flour, salt, and baking powder in a container, then add to the egg mixture, with the mixer still on medium speed. Switch to low speed, and add the butter, followed by the bird cherry mixture, each time mixing just enough to combine, and scraping the sides of the bowl with a spatula as needed. Line a 21 cm square mold with parchment paper, keeping an overhang of paper on all sides. Transfer the batter to the mold, and bake in a 150 C / 300 F oven for 1 hour, until the cake’s internal temperature reaches 100 C / 210 F. Let cool completely on a rack. Unmold the cake, and wrap in plastic. Unless you plan to finish it in the next day, you might want to cut it into quarters, wrapped separately, and store some of the pieces in the refrigerator where they can be kept for up to a week. In a small saucepan, bring the water to a boil. Remove from the heat, add the sugar, and stir until dissolved. Reserve. Place the lingonberries with about 30 g of the above sugar syrup in a saucepan over medium heat. Bring to a simmer, and cook for about 2 minutes, until the berry skins begin to crack. about 1/4 of the remaining syrup, and process until smooth. Pass through a chinois, then add the rest of the syrup along with the orange and lemon juices. Refrigerate for at least 3 hours. Bloom the gelatin in a small container with about 1/5 of the milk. In the bowl of a food processor (or a blender), combine the sugar and dill, then grind until reduced to wet pulp. Transfer to a saucepan, add the salt, white chocolate, and approximately half of the remaining milk. Warm over medium heat, stirring constantly with a rubber spatula, until the white chocolate has fully dissolved and the mixture is hot to the touch, but not simmering. Remove from heat, add the prepared gelatin, and stir until fully dissolved. Pass the mixture through a chinois, pressing on the dill solids with a spatula to extract as much liquid as possible, then discard the remaining solids. Stir in the remaining milk and the heavy cream. Pour into a 1 liter siphon, and charge with three cartridges of N2O, shaking several times between each cartridge. Refrigerate for at least 3 hours, and up to a couple days. Cut the bird cherry cake into 2-3 mm thick slices, and place on a wire rack set on a baking sheet. Bake in a 175 C / 350 F oven for 20-25 minutes, until the cake starts to smell charred (the slices will still be soft). Transfer the cake slices to a paper towel, and let cool. Once the slices have cooled, they should be hard. Crumble between your fingers to get crumbs of various sizes, and reserve in a container lined with a paper towel. Place the sorbet in the refrigerator for 30 minutes to soften. Cut the cake into 2.5 cm squares. If the cake was refrigerated, microwave the squares on a plate for about 20 seconds, until warm and soft. Chill sundae glasses by filling them with ice water. Then empty and dry with a towel. In each glass, add the following layers in this order: two cake squares, one sorbet scoop, dill mousse, cake crumbs, three cake squares, one sorbet scoop, dill mousse, cake crumbs. Serve immediately!